The Short Version: AsiaCharm.com is an international dating service dedicated to introducing Western men to Asian women. The site’s high-speed communication tools empower singles to overcome vast distances in the search for romance. Some daters may have security concerns about meeting foreign love interests, but AsiaCharm’s team works hard to put those concerns to rest and ensure members stay safe while mingling with one another online. Its safety tips and community guidelines provide a framework for members to treat one another with respect and report any unsavory behavior on the dating site. AsiaCharm has a zero-tolerance policy when it comes to online harassment and does everything in its power to help singles build international relationships without jeopardizing their privacy and safety. Singles can feel reluctant to try online dating for many different reasons. They may not have the time or money to invest in the experience. They may wonder how effective it’ll be. But the most common reason we hear from single people is that online dating doesn’t seem like a safe way to meet people. AsiaCharm connects singles with authentic Asian women who have been vetted by the team. Some people worry that posting private information online will make them vulnerable to scammers. Maybe they’ve heard online dating horror stories about singles who’ve lost thousands of dollars to someone they met online. It’s a legit concern — in 2017, Canadians lost over $19 million in online dating scams — but online daters can take steps to stay safe while searching for love on the web. One of the most important things singles can do to protect themselves is research the online dating scene and choose an upstanding site known for having top-notch security features. Many dating sites in today’s privacy-conscious atmosphere have prioritized online security and taken strides to give singles greater peace of mind when they join the network. AsiaCharm, a niche dating site, offers to protect its users through cutting-edge security protocols and 24-hour site monitoring. The site’s team is keenly aware of its responsibility to its community and has promised a scam-free dating environment where singles anywhere in the world can form friendships and relationships without worrying about their personal safety. AsiaCharm is an international dating site with over 10,000 members. You can join for free to take a look around the site and see if anyone catches your eye. Signing up takes less than a minute. AsiaCharm verifies identities via email address and allows users to go by their first name or a nickname on the site depending on how comfortable they feel. The dating site does not allow its members to share contact information, including email addresses, on profiles or in messages. Members must request to exchange contact details through the site. This keeps everyone safe and allows the team to vet any information given to members. AsiaCharm has a strict policy against posting sexual content, copyrighted materials, or inappropriate photos. Anyone found undermining the dating site’s integrity will be removed immediately. Members can report any behaviors that violate the site’s Community Guidelines. AsiaCharm gives daters from around the world a platform where they can chat in real time. 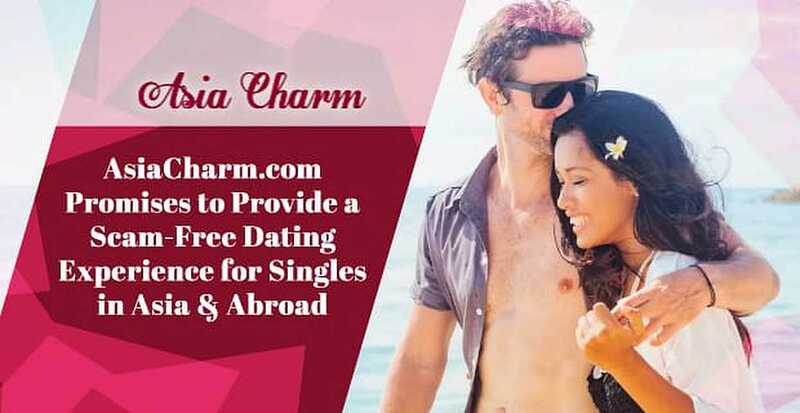 Instead of offering singles a dating free-for-all, AsiaCharm ensures that only commitment-minded folks can communicate on the site by implementing a paid credit system. Members must buy and use credits to send and receive correspondence here. Premium services, including chatting or sending virtual gifts, cost a certain number of credits on AsiaCharm. If you close your account, the value of any unused credits will be refunded to you automatically. If you believe you have been scammed by another member, you can report that person and request your money back on any gifts, flowers, or communications sent to that person. AsiaCharm also refunds credits for meeting requests if that request is declined by the member. When you join AsiaCharm, you have the support of a team of dating experts whose mission in life is to bring more love into the world. The team helps Western men meet and woo Asian women through high-tech and low-cost communication tools. AsiaCharm’s staff works 24 hours a day, seven days a week to ensure people have a great time on the site. Members can contact the customer support team via email at [email protected] Whether you’re looking for international dating tips or a money refund, you can contact the team to get exactly what you want from your online dating experience. The AsiaCharm team has also written detailed safety tips to help its users wise up and stay safe while online and offline. At the top of the list is never sending money to members on the site. The dating experts encourage singles to trust their instincts and carefully vet potential dates before making a serious commitment. Online daters should take common-sense precautions when going on a first date with someone they have met online. This includes meeting in a public place, telling friends or family members where you’re going, and staying sober or watching your drinks during the date. AsiaCharm refers its users to nonprofit 24/7 hotlines, including Planned Parenthood, in case of emergency. Online dating can seem intimidating to people who have never tried it before. Just the thought of posting their real names or ages on a site can be scary to some private folks. However, not all dating sites ask singles to go too far outside their comfort zones. AsiaCharm provides a platform where you can keep your personal, financial, and contact information private until you build trust with someone online. Thanks to the dating site’s privacy measures, you can put yourself out there to available dates without putting yourself at risk. Since its launch in 2013, AsiaCharm has facilitated many authentic connections between relationship-minded singles in Asia and abroad. Thousands of people now use the site to chat, flirt, and meet dates from around the world. You can enjoy a safe and friendly dating atmosphere on AsiaCharm, which uses state-of-the-art measures and 24/7 safeguards to protect its growing community.